The Common Wombat (Vombatus ursinus), also known as the Bare-nosed Wombat, is a large, stocky marsupial found in a variety of habitats in south-eastern Australia, including Tasmania and Flinders Island. This species is quite common in suitable habitat throughout it’s range, although its distribution has shrunk significantly over the past century. There are two other wombat species found in Australia – the Northern Hairy-nosed Wombat and Southern Hairy-nosed Wombat, both of which have been severely affected by habitat loss and live only in fragmented populations. 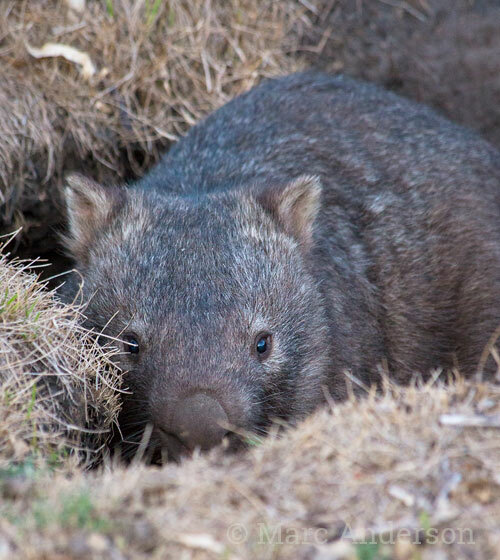 Wombats live in burrows and spend most of the day resting underground. They emerge around dusk or after dark to feed, grazing mainly on grass and sedge. They mark their territories with scent as well as interesting cube-shaped droppings. 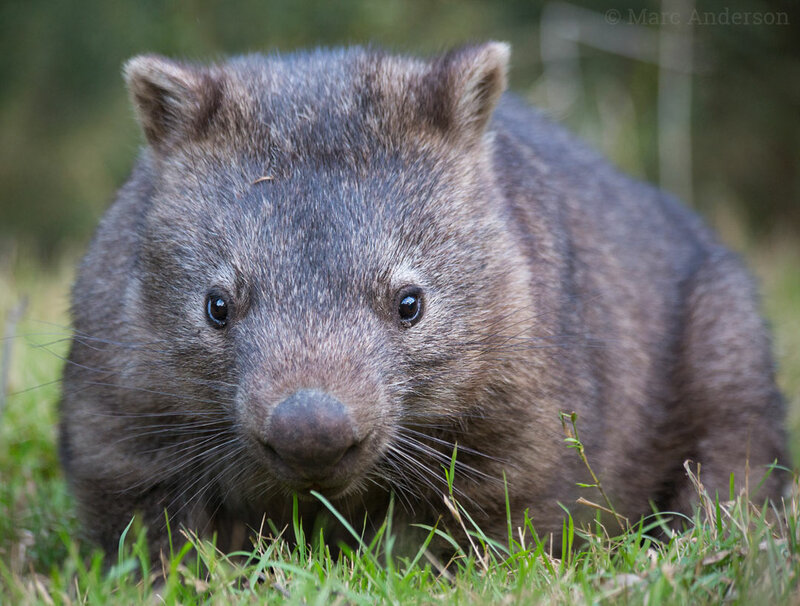 Wombats are territorial, and they can often be heard squabbling aggressively. T61a In this recording, a Common Wombat is grazing in the foreground and in the background the harsh hisses of another wombat can be heard. These rasping calls are often giving when two wombats are having a territorial dispute. Recorded in Capertee National Park, New South Wales. MCANB20 This second sample captures some grunts and huffs from a Common Wombat in Dharug National Park, New South Wales. T61b In this sample, a Common Wombat can be heard munching on grass near the microphones and giving a hearty sneeze at 0:16 seconds! Recorded in Capertee National Park, New South Wales.